You will need roughly 1/4 cup of colored sprinkles, if using. This can be made without a mixer. Cut the butter into large cubes and put into a five quart bowl for 5 minutes to soften a bit. Add crisco and sugars and mix for 1 minute. Add eggyolks, vanilla and lemon zest and salt and mix for another minute. Sift the flours together and add to the butter mixture, only until just incorporated, do not over mix. Divide the dough into 3 portions, flatten into thick discs and sprinkle each with 1 tsp flour and chill for 5 minutes. Cut 6 pieces of wax paper the size of your cookie sheet. Roll each portion of dough between two pieces of wax paper until about 3/16th or 1/4 inch thick for sturdier cookies. Peel off and adjust the paper if you get wrinkles. This is the easiest way to avoid adding too much flour. Lift your rolling pin before you get to the edge of the dough. Do not remove your wax paper when done rolling, then stack your rolled dough and place it in the fridge (flat in a pan) for 1 hour or 30 minutes in the freezer. The dough will get very stiff and make it very easy to cut out shapes. Take one sheet of dough at a time, peel of the top sheet, replace, turn over and remove the other sheet. dip your cookie cutter in flour, shake off the excess and cut cookies close to each other. It will be very easy to remove and transfer to line cold cookie sheet if you move quickly before the dough gets too soft again. Place on parchment paper or thin foil lined cookie sheets, roughly 1.5 inches apart. Sprinkle with colored sugar. Try to put only one shape or pattern per pan, so it will cook more evenly. Bake on the midle rack in a pre-heated 350F oven for 12-14 minutes until edges are golden brown. Do not underbake. Cool for 10 minutes and then use a pie spatula to remove to racks to cool completely. They are very fragile. Save all the scraps in a bag and re-roll only once more between more sheets of wax paper, rechill. After that round of cookies, use the scraps to make balls, and press down with bottom of a glass. makes approximately 50+ cookies. Stack same shapes 3 deep and wrap in wax paper, store in air tight tins. Keeps for 2-3 weeks. Recipe by Sister. Photo by Nephew. is confectioners sugar same as icing sugar? oh no! how many cups in 1 pound? Thank you very much Sister! and MM. May god continue to bless you. You are a blessing to many. Amazing! Will try this during the holidays. Maraming salamat. I’m sure you made many MM fans very happy! edee, are you in Manila? There is Crisco in Rustan’s. Look for it either in the baking products section or together with cooking oils. If you do not have crisco just use another 1/4 c. of butter. The crisco helps keep the shape, all butter needs to be kept very cold. Instead of cake flour substitute 3/4 c. more all-purpose plus 1/4 c. cornstarch.Confectioners sugar is the same as icing sugar. If I may answer edee’s question, cake flour is softer than AP and bread flour. What that means is that it has a lower percentage of proteins that develop gluten (or the structure that is apparent when you pull bread apart). If you cannot get cake flour and you feel you just have to try this recipe, I’d imagine you can substitute it with a lesser amount all purpose flour plus some cornstarch. You can google for ratios. Just make absolutely sure that you do not overwork your dough to prevent it from becoming tough. Re shortening, somebody mentioned you might be in Ireland? Look for Cookeen brand. If you are here in Manila, Crisco is available in most major grocery stores. Thanks sister! Wish I could try this out but my balikbayans have started to arrive. Will start trying these out,including your fruitcake version next year. Hopefully,by the year end 2009,I would have tried all your cookie recipes. At least I have baking projects lined up for 2009…hahaha …ensaimada,choco cake,now cookies. Exciting…. Edee…if you must really have CAKE FLOUR to use with other cakes you would like to make …say mocha chiffon cake with mocha buttercream…here is another option for you: BEFRIEND your neighbourhood bakery owner. Then if she/he is your ka-bagang (? ), then you can ask him for a few pounds of cake flour to sell you. Now, I am positive they have it…not as cake flour but something like low gluten whatever it is called there! But then if there is really no cake flour int he LAND OF WHISKEY, then Sister’s sub is a must follow! For cakes though…for every cup of all-purpose flour , subtract 2 tbsp. of the wheat flour and sub that with 2 tbsp. cornsatrch….this is for cakes though that calls for cake flour! Thanks, Betty Q, yours is the more accurate substitution but cookies are a lot more forgiving than cake. Even 5 c. of all purpose flour will do, cake flour gives a finer grain and a more tender cookie. You all have one year to practice for Christmas ’09. Edee, Ireland has excellent butter like the Kerry brand, forget about Crisco, it’s cold enough there to use all butter. THANK YOU Sister and MM! God Bless You for your generosity. I have a slow punch when it comes to cut cookies. I am more of a drop cookie person. Sister, you, Bettyq and MM are my profile of inspiration, courage and model. With all the pointers and talking points you put in – no more excuse for me not to roll up my sleeves and give this sugar cookies a shot this weekend. Many thanks. And that tip on using wax paper to avoid adding too much flour is genius. Maybe that’s why my wife’s first try wasn’t too good. I cant wait to try this out, thanks MM & Sister! yum…oh! I love this recipe! Many, many thanks to sister and MM. And thank you too for the suggested substitutions and the equivalent measures. I was a bit apprehensive upon seeing shortening and cake flour but after reading the comments and the responses of sister, now, I think I can do this. Thanks MM & Sister for sharing this cookie recipe. Looks yummy! I am about to have a baking session this weekend and I plan to include a batch of this recipe. My usual goodie bag treats are Doubletree Hotel chocolate oatmeal cookies and spiced pecans. This would be a wonderful addition to my holiday bags. I would love to make sister’s fruit cake (I love fruit cake! ), but I think it’s best if I make it by June of next year so that it’s ready to consume by the holidays. I can’t wait! After you try this recipe with 5 c. total flour and can manage the cut outs nicely next time reduce the flour by 1/3 c. to make even more delicate cookies. For SPRITZ cookies reduce flour by 1/3 c. chill dough for 30 min, and use cookie press and very cold cookie sheets. Press directly onto sheets, do not use any liner and do not grease. Bake at 350 F for 10-12 min until golden brown on the edges. 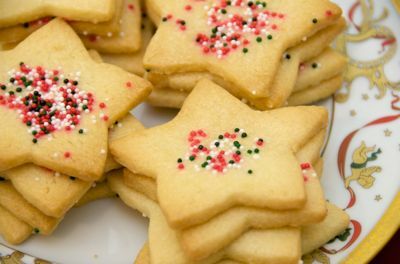 Mom used to make spritz cookies with star margarine. She sat there patiently for hours pressing them out of a cookie press before Christmas. She never made any other kind of cookie. The star margarine worked well in the intense heat and humidity of Manila and Cebu. Teresa, make your fruitcakes the first week in November when newly harvested, very fresh nuts are available, ask for “new crop” at places that sell nuts loose. Raisens will be good, too. I’ve been known to ask for the pack date on the 25 lb. box. A couple of weeks aging in your fridge and they will be good for Christmas. Do not freeze fruitcakes. yes sister we do have lovely excellent butter here, I’m spoilt for choice when it comes to that! …..
Pressureâ€¦pressureâ€¦pressure. Have not baked any cookies or cakes in my 40 something .. ehem…life. I do have several pages of cookie recipe clippings from magazines … hoping they will keep me occupied when I retire. what difference will it make in the final product if i use salted butter sticks? chinachix, You can use salted butter. I only recommend unsalted because generally it is fresher because of a shorter shelf life and it is the butter of choice of most pastry chefs.The additional salt is very minimal. This is such a wonderful gift =) Thanks Sister and MM!!! Thank you for the update, MM! Happy Holidays to all! Here is another information overload for you Jun…also Chinachix…anything that comes fromyour kitchen just like Sister’s Kitchen…(Sister, what color is your kitchen…just a thought..wouldn’t it be neat if your kitchen is kknown as say THE PURPLE TURQUOISE KITCHEN!!! )…anyway, as I was saying people look forward to! So, in this light, i start my cookie baking First week of December!…these will be the ones that will be mailed…so I use salted butter …salt acts as a preservative as well without using those things I cannot spell off the top of my head at this very moment! Betty Q- my kitchen is painted tomato soup red. Different shades actually, depending on the year and the last paint job. whit, just divide everything by half, simple math, you should be okay. Number of cookies depend on size made.If you’re only going to make half a recipe don’t bother, go buy some cookies. Use a timer, set at 10 min. so you can check the cookies before they burn. Or, chill the cut cookies on the sheets in the fridge and bake them consecutively after all the shapes are cut out. I’m glad you enjoyed making them and hope you have a Merry Christmas! Thanks for the recipe sister! Tried this one out for the holidays and it turned out well. My son couldn’t stop eating it. Made me regret doing only half a recipe. hahaha.